One of two sources used by Spode from Views of Rome and its Vicinity published by J. Merigot and R. Edwards, London, 1796-98, to create the pattern Rome also known as Tiber. A view of the Castle and Bridge of St. Angelo. 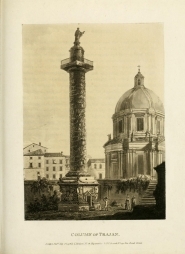 The second source print titled Column of Trajan. Trajan's Column was taken out of context and inserted into the center of the view depicting the Castle and Bridge of St. Angelo to create the Spode pattern. 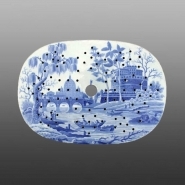 An earthenware platter with drainer printed in blue with the Rome pattern also known as Tiber. It is unusual to find an early printed platter with the original drainer. (Drainer shown separately below.) This pattern was inspired by two views taken from engravings found in Views of Rome and its Vicinity published by J. Merigot and R. Edwards, London, 1796-98. The two related source prints are included below.